The village of Exeter is located on the land of the Gundungurra and Darawal peoples. European settlement of the Exeter area began with a 500 acre land grant by Governor Macquarie to James Badgery in 1821. 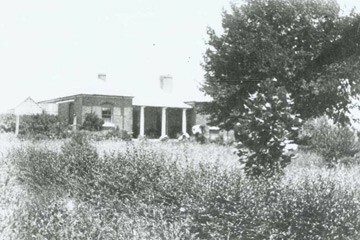 The present day Vine Lodge house was built by Henry Badgery in 1839. The main fireplace in the outbuilding seems to predate the structure around it and it may be that the fireplace was once part of an earlier timber building predating the house, as early as 1826. The house was partially destroyed in a fire in 1855. The Badgery family met with financial difficulties in the late 1890’s resulting in the sale of estate land and the subsequent establishment of the village around the new railway station, which was named Exeter (James Badgery’s place of birth). The land was again subdivided in 1915. 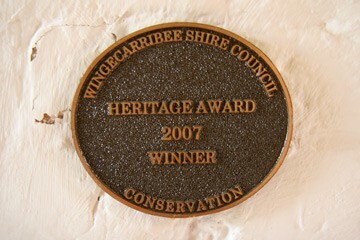 The Vine Lodge house remained in the Badgery family until 1978, a period of some 140 years. The House Precinct comprises a number of buildings arranged in a pattern typical of such estates, main residence and detached outbuildlings, being kitchen and stables with loft. Originally buildings were linked by a covered way. It is described as Colonial Georgian, however it incorporates features of the Indian Bungalow style. 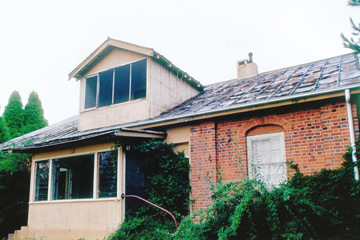 The house has a simple three part cubic form, with a central corridor and much of its early Colonial Georgian detailing intact, including windows and doors (multipaned glazing and simple four panel timber joinery). The rooms are simple and well proportioned, with windows placed symmetrically. There is a large sandstone cellar. Local materials were used, including stone and timber from nearby Stonequarry Creek. The red clay face brick was from neighbouring Sutton Forest. The cedar joinery is from the Shaolhaven gorges. Vine Lodge House and Outbuildings were adapted and altered over time. The house was altered in the 1880s with the addition of a timber gable to the southern central bay (attic), stair in the living room to the attic and the reorientation of the entry to the southern side. 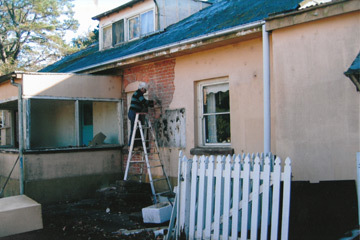 The most drastic changes were made in the twentieth century, most notably the removal of the southern veranda and the roof was replaced with a single east-west gable roof. This century, the property was lovingly restored by the current owners. Early twentieth century additions were removed. The main house was restored as a residence. The conservation and adaptive reuse of the two outbuildings resulted in a guest wing and artists studio. A new link and pavilion to the house provide necessary additional living and kitchen areas. The new sections are contemporary reinterpretations of farm buildings typically found on the property. The original very rare three hipped roof form (with central gable to the southern side and dormer window) was reinstated (replacing a simple gable dating). There was sufficient evidence to be able to reconstruct it close to its original design thanks to illustrative documentation, the archaeology of the chimney stacks, wall plates and joist ends. 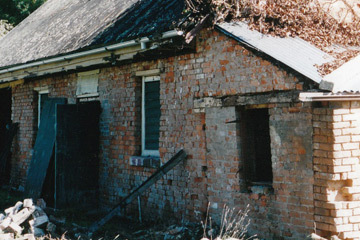 The near derelict outbuildings were rebirthed. 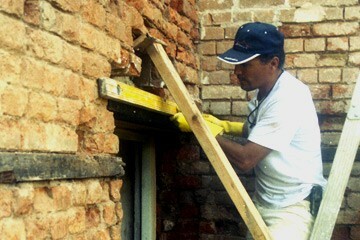 External and internal concrete render was removed from outbuilding brickwork. 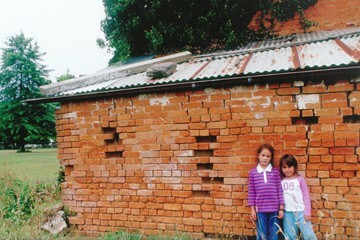 The outbuildings were roofed with corrugated iron, over the existing timber shingles. 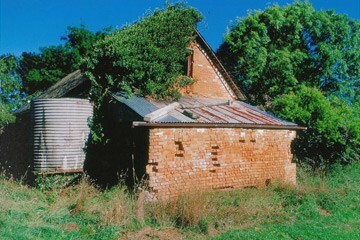 Outbuilding brickwork was limewashed. The southern veranda was reinstated. Tuscan columns to the northern veranda were revealed and a missing third column installed. Sandstone paving from the veranda floor had been recycled in the garden, this was retrieved and reinstated. Unless otherwise stated all images from private collection. 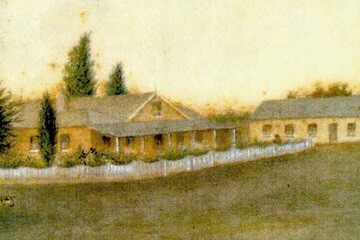 Painting of Vine Lodge House from the cover of “From the Hawkesbury to the Monaro”.